35 weeks. I'll take it. I'll admit I thought they would be here by now just by the sheer weight of my belly. 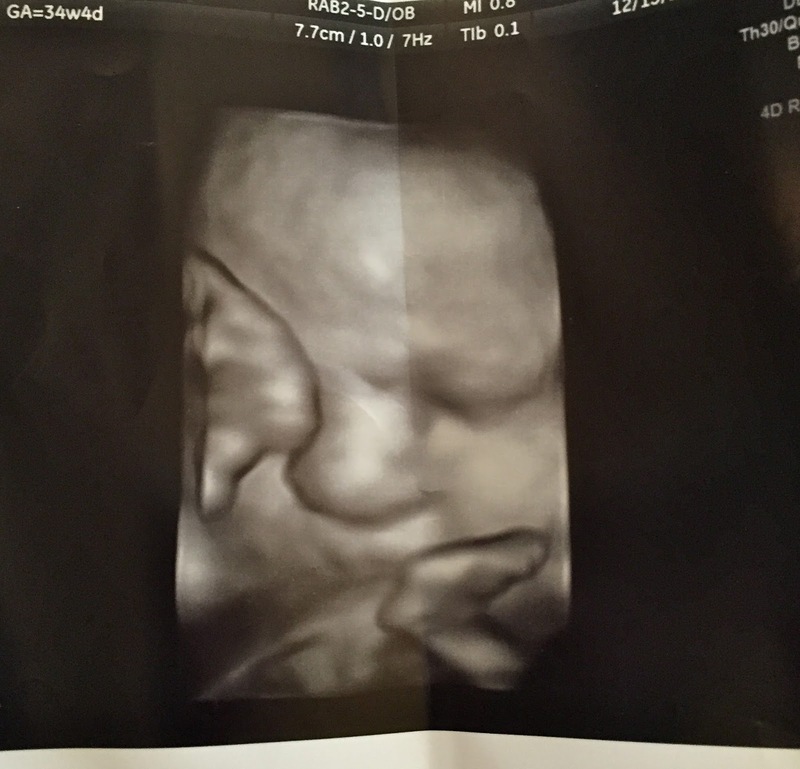 We had an ultrasound yesterday for growth and BPP. Emmy is measuring 5 lbs 12 oz and Bennett is 5 lb 8 oz! So I'm carrying around 11+ lbs of baby and measuring at 46 weeks. Meaning, if I was pregnant with one baby- I would be 46 weeks pregnant. Holy. Moly. 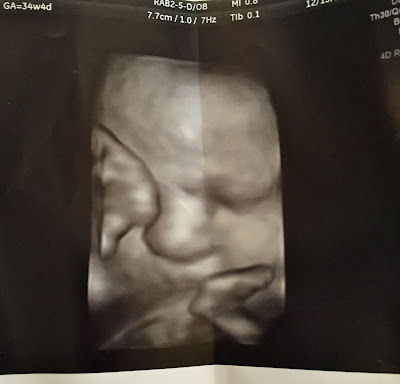 The BPP went normal except they weren't practicing their breathing so we had a non-stress test (I am hooked up to the fetal monitor and watched for 20 minutes) and they passed with flying colors. No bad news there, they just weren't up for practicing their breathing while on screen. We had a doctor's appointment after and she checked to see if I was dilated and I was closed. We talked about induction and to my surprise, my OB said she would at 38 weeks. 38 WEEKS! Here I thought I wouldn't go past 37. 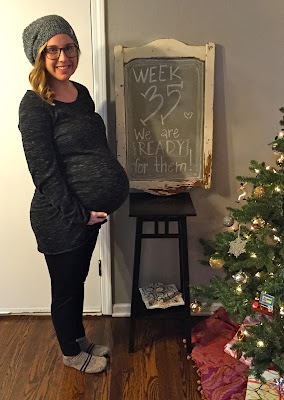 38 weeks is 3 weeks from now and the dates we're looking at are January 7-8. We will schedule it next week, if I make it to then. It. Seems. So. Far. Away. The worst part is that I would have used an entire month of leave without them. I know this sounds like complaining- but what else is a blog for? I'm incredibly lucky to have two very healthy, plump babies and to be a healthy mom so far. I know this isn't true for a lot of twin moms, so for that I am truly grateful. The only picture we got from this week was of Bennett. Emmy was being shy, which until now has not been the case. It's been a little over a week since I stopped working and I'll admit, I am frustrated. Like I said before, I'm using my maternity leave to be off now and it makes me sad I'm not spending it with the babies outside my belly. Alex has been great, reminding me that I'm taking the time now to make sure the babes are as healthy as can be. I just get stir crazy sitting around all day. Everyone has been great offering to help me with things and wanting to hang out- but sometimes even just talking with people leaves me short of breath. Another thing I have failed to mention are the stretch marks. I was lucky enough to not have them up until week 32 and then they appeared just around my belly button. I felt completely defeated. The most uncomfortable part about my belly is how itchy it is. That means its stretching (even though I thought for sure it couldn't anymore). I don't believe any amount of body butter or oil could have prevented the stretch marks from appearing. Who knows. I'll let them be my battle scars. Ever since we found out we were pregnant, Alex has been leaving me post it notes on my mirror. It made the mornings I didn't want to go to work easier and it made the times I didn't feel glamorous or pretty, bearable. It's the little things that keep me going. I know that I'll eventually look less like a bowling ball again but it's hard on the self esteem, especially when getting dressed becomes a constant battle. Thank god for oversized sweatpants. With Christmas 8 days away, I only want one thing... babies born healthy and happy... and preferably before the new year. The thought of going into January makes me feel physically faint. This is my favorite time of year though and I'm so excited to meet Emmy and Bennett, as I'm sure some of you are too. Thank you for your continued support and love. I can't tell you what it means to Alex and I. I will update on the blog now every Thursday, unless something HUGE happens between now and then. Fingers crossed.